The first time I had Yum Woon Sen I cried, and it wasn’t from tears of joy. It was my first week in Bangkok, and I was eating at a random restaurant maybe on the third floor of CentralWorld, one of the huge malls in Bangkok. I had just met my boss, but hadn’t started work, and the two other Thai friends I knew from my UNC-Chapel Hill days were working that day, so I was exploring downtown Bangkok on my own. As I sat in the mall restaurant alone at a table, I peered out the glass window at the hordes of Thais and foreigners ambling confidently with friends or family, carrying shopping bags, knowing exactly where they were going. It was one of those moments where I was surrounded by people, but felt so alone. I had looked at the menu full of glistening pictures of Thai food, and the one with the clear glass noodles, colorful veggies and crushed peanuts jumped out at me—but no one was there to tell me how crazy spicy Yum Woon Sen could be. Especially for a farang (foriegn) tongue that wasn’t used to ped mak mak (very spicy) yet. It was pretty common those first few weeks in Thailand for me to be scarfing down delicious food with tears streaming down my cheeks, and a huge smile on my face because even though my mouth and sinuses couldn’t handle the spice yet, it just tasted so good I couldn’t stop eating. But this time I was crying not only because it was so spicy my mouth felt like it was just struck by a fireball, but I wanted to keep eating because I was hungry, I was also crying because I was getting over jet-lag, and culture-shock and loneliness were slowly setting in. After that first week though, things only got better and better, not only for me, but for my tongue. I just kept eating spicy food, even though the tears would come and the flames lit up my mouth, but over time my tongue even adjusted so now I can confidently say, “Chop ped mak mak! (I like very spicy! )” to any Thai street vendor, and eat most spicy Thai dishes without pain. And over time, I just kept pushing through the culture shock confusion and the pain of wanting to fit in and have friends that comes with being a newcomer to any place, and I adjusted to Bangkok. I became best friends with my co-workers, found an awesome church where I felt at home, found a Thai man I fell in love with, and I became one of those people walking around in CentralWorld who knew exactly what I was doing. I just had to keep going through the flames, and eventually passed through, not even realizing how much stronger I was becoming. All that to say, now I love Yum Woon Sen, and love how I can make it at home as spicy or not spicy as I want. 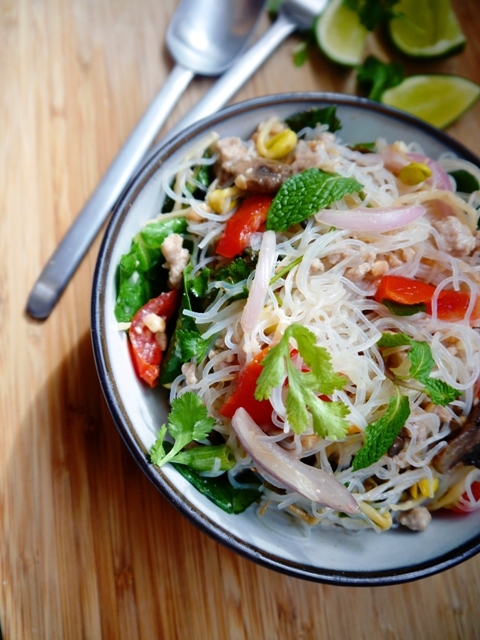 What’s so magical about Yum Woon Sen are the bean thread glass noodles. When I first saw them, I was a bit freaked out. They are clear, super thin, slippery, and almost look like they are noodles aliens brought over from another planet. Since they are made out of mung bean, Thais who are on a diet love these eating these noodles instead of rice noodles. It was tricky for me to find the noodles at our Asian market, so if you have trouble too, you can order your Thai Bean Thread Glass Noodles on Amazon, and that’s an affiliate link, so you are helping out our fam if you order from there! Yum Woon Sen is full of fresh veggies, crushed peanuts, and a spicy, lime dressing that puckers your lips and revives your senses. If you have a lot of veggies to use up and are in the mood for a fresh Thai dish, try out Yum Woon Sen today! 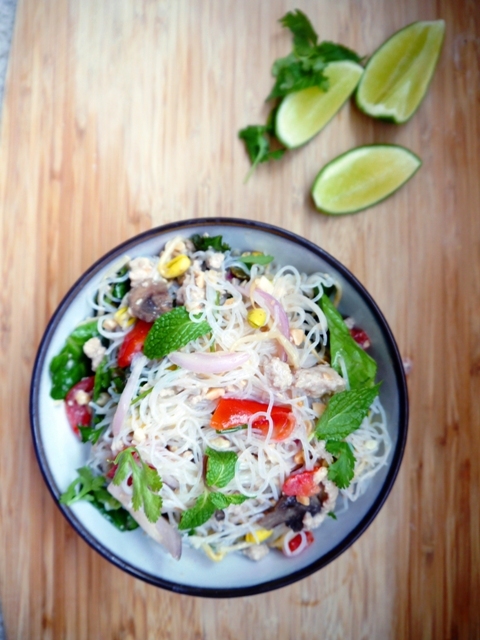 In the mood for a fresh Thai salad? 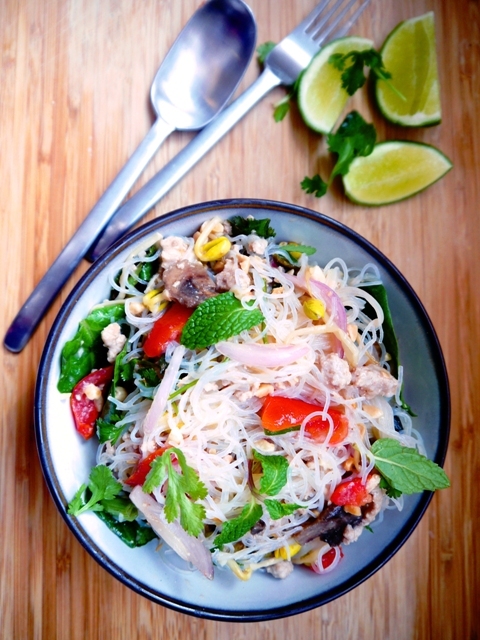 Try out Yum Woon Sen, a spicy Thai glass noodles salad! Make noodles according to package directions. But if the directions aren't in English, and you don't know what to do, here is what I usually do: soak the noodles for about 10 minutes in warm water. Boil about six cups of water or so and add pre-soaked noodles, and be sure to cut off the strings first that are holding the bundles together. Let boil for about 3 minutes, or until noodles are cooked, but not mushy. Drain and put it in a mixing bowl. Warm cooking oil in a wok or pan of your choice. Add garlic and chilies, stir until fragrant. Add meat and mushrooms. While cooking it add a few teaspoons of fish sauce. Once meat and mushrooms are cooked, turn off the heat, and remove the pan from the burner to let the meat cool to room temperature. Once noodles and meat are at room temperature, add the meat, or tofu, and mushrooms to the noodles. Then add in the shallots, tomatoes, bean sprouts, spinach, cilantro, mint, peanuts, fish sauce, lime, sugar, and roasted rice powder. When you taste it, you want lime flavor to be in the lead, followed by a salty flavor, and the sugar is just used to balance out the flavors. You can use any veggies or herbs you have on hand that you think will go well together! Feel free to add more or less of any veggie, and really customize this to your liking! My mouth is watering just thinking about this dish and I have everything I need to make it . . . except rice powder. Is it added for flavor? Thanks for your beautiful posts! That’s wonderful you have almost everything! The rice powder is added for flavor, and you can make your own rice powder yourself if you want. You roast rice in a cast iron pan until browned, then put it in a spice grinder or coffee grinder until finely ground. Thanks for your sweet comment Cindy! Hello, this is a wonderful recipe, thank you for sharing. On a side note, do you cook your mushrooms or are you serving them raw? Thanks Amanda! That’s a great question! I would cook the mushrooms with the meat to soften them up, I just edited that in the recipe! I made this… with a few alterations. It was delicious thank you so much! I’m so glad you enjoyed it Yarett! Thanks for your comment!